We’d love your help. Let us know what’s wrong with this preview of The Guru Papers by Joel Kramer. 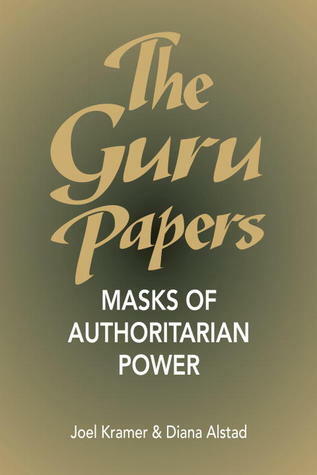 To ask other readers questions about The Guru Papers, please sign up. I found this book useful when I was attempting to understand how I had gotten myself involved in a cult-like group. The authors are very thorough in their deconstruction of the dynamics of authoritarian relationships both in spiritual groups and in society as a whole. In reading it, I gained a great deal of insight as to my own relationship to those tendencies. This is a very unusual book that is aimed at pretty much only one audience: people who have been influenced, directly or indirectly, by an authoritarian group. Sometimes these groups are called charismatic sects, sometimes they are called new religions, and sometimes they are called cults. Through the arguments in the book the authors, experienced writers and yoga practitioners, show the fallacies that lie at the basis of coercive authoritarian relationships. In fact, this book is a powerful cura This is a very unusual book that is aimed at pretty much only one audience: people who have been influenced, directly or indirectly, by an authoritarian group. Sometimes these groups are called charismatic sects, sometimes they are called new religions, and sometimes they are called cults. Through the arguments in the book the authors, experienced writers and yoga practitioners, show the fallacies that lie at the basis of coercive authoritarian relationships. In fact, this book is a powerful curative for a person who starts to question their own involvement in one of these groups, or who wants to understand the involvement of a friend or a loved one. In those cases, it can help in a powerful way to start to loosen the mental bonds that hold people in these relationships. This book changed my life - after reading this I was finally able to let go of all my Christian guilt over my questions and doubts and move on.... what a relief it was and still is! I found this book inclusive. It did explore the dynamics of cults but it went deeper into the dynamics of indoctrination itself and suggested that we have all been indoctrinated in one way or another. Moreover, it realistically questioned such sacred concepts as unconditional love. If some of the more vociferous atheists and evolutionary biologists have left a void, this book fills it in the sense that it recognizes our selfishness but it also recognizes our desire to find a sense of morality an I found this book inclusive. It did explore the dynamics of cults but it went deeper into the dynamics of indoctrination itself and suggested that we have all been indoctrinated in one way or another. Moreover, it realistically questioned such sacred concepts as unconditional love. If some of the more vociferous atheists and evolutionary biologists have left a void, this book fills it in the sense that it recognizes our selfishness but it also recognizes our desire to find a sense of morality and community beyond religion. And it doesn't let Eastern religions or 12-step philosophy off the hook either. It equally indicts all. Interesting general philosophical concept, though perhaps lengthy and drawn out in order to reify the idea. Applicable to many situations, but perhaps it would have been more interesting to hear more case studies where it can be applied. Some interesting insights with some more questionable parts e.g. quasi-satanic panic stuff, speculative psychologizing on the historic development of religious thougth. Wish it had bibliographical references. Not having them detracts from an otherwise great book.